I wasn’t sure what to expect going into this book. It seems like almost every other novel about Druids and Druid-related fantasy is overly stereotypical and predictable … but this book breaks from such predictability, yet still does contain many of the expected tenets of a novel about Druids. Yes, there is magic; yes, there are fey creatures; yes, there are transformations; yes …. However, there are some unique elements to it as well that make it an engaging read for those who enjoy Druid stories. This novel is a sequel to an earlier novel about the same Druid clan. From what I gathered from the opening chapters, these Druids, headed by the brave and philosophical Ainvar, hail from Gaul. After being grossly defeated in battle by Julius Caesar, they set sail for Hibernia to start life over. All seems well for a while, but shortly after they arrive they learn that strong magical forces are afoot in this new land, and Ainvar must learn to come to terms with these spirits and beings not only for his safety, but also for the safety of the entire clan. To be honest, I was pleasantly surprised by this novel. I was not expecting it to be any good, but several things made it a worthwhile read for me. First, I liked that these Druids were from Gaul and not your stereotypical magicians born and bred in the British Isles. That was just a nice twist on something that is often taken for granted in a lot of fantasy novels. I also liked that the story was rooted in history — the novel seemed well-researched and well-composed in that regard and also more powerful because of that real-world connection. Second, I also liked the way that the author narrated the story from Ainvar’s perspective, a first-person account. I think she did a good job of writing from the male perspective. Ainvar’s voice was coolly soothing and his emotions engaging, his anger at the Romans and also his lust for his wives perfectly balanced, never hyper- (or hypo!) masculine. There were times, of course, when his coolness was more than I would’ve liked. Particularly at the beginning of the novel, Ainvar seemed detached and almost robotic, but things solved themselves later on as the action picked up. Perhaps it was only because the novel was a sequel and thus much of the first chapters is explaining backstory and not truly beginning the “present” story. Don’t worry — any slowness or coldness of the beginning of the novel is rapidly forgotten once several chapters have progressed. Action paves the rest of the way, shaping the novel into a true adventure story. The reader can expect to see the creatures of traditional fantasy, but when glossed with Ainvar’s gentility and his wife’s strong lead, plus other plot twists thrown in, the novel is hardly drab or mundane. I don’t want to give away too much, but let’s just say that there is a great deal of magic in the air, including some shapeshifting, and — even yes! — a terrifying banshee. The third thing that I really liked about the novel is the presence of strong female characters. All of Ainvar’s wives are interesting and fascinating women who hold power in their own ways, but particularly Ainvar’s wife Briga was a stunning and excellent example of a strong female character in a fantasy novel. The way that she supports and guides Ainvar through the later stages of the novel is heartwarming and invigorating, to say the least, almost or entirely a character with equal power to him. After reading about her, she will be a hard woman to forget. 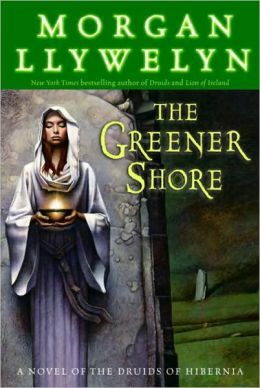 I personally will not be reading another novel in this series, but I would recommend it to anyone who likes fiction about the Druids, especially fiction that adds a few extra knots and interesting twists to a tried-and-true fantasy tradition.